The National newspaper of Papua New Guinea published first version in Steven's Window, Friday 05th February, 2010. Picture: The National newspaper. In one of my regular visits to the University of Papua New Guinea Bookshop in recent times I came across a book: Our Time but not Our Place: Voices of Expatriate Women in Papua New Guinea. The book is edited by Myra Jean Bourke, Susanne Holsknecht, Kathy Kituai, and Linda Roach. Melbourne University Press published the book in 1993. The chance I had seeing this book for the first time, I could not resist buying it for my personal library. I have two reasons for buying the book: First, I figured the book is useful for my research on how Papua New Guinea is constructed through the eyes of expatriates, in this case how expatriate women saw, lived, and experienced Papua New Guinea. This perspective is one that is difficult to know until it is written down as in the book. Expatriate women have varied reasons to come to Papua New Guinea. The reasons are many, but the ones around which the book features, include adventure in exotic surroundings, seeking fortunes, changing jobs, running away from unhappy situations, furthering professional or academic interests, and others came here because their partners or parents had work to do here. Some of the contributors to the book lived in Papua New Guinea since the 1930s. The book covers the stories of women from Australia, Britain, New Zealand, China, French, Ireland, Germany, Netherlands, and North America. “The writers chose to present their experiences in the form of essays, diary extracts or letters, memoires and fiction. 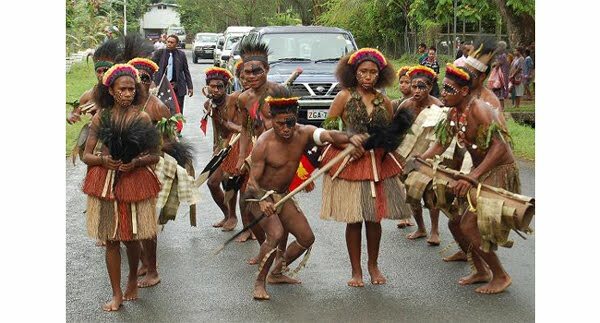 Some focus on incidents, issues or characters while others review the entire period of their sojourn in Papua New Guinea,” according to the editors of the book. The second reason for buying the book is that many books written about Papua New Guinea are difficult to get hold of from our end. The University of Papua New Guinea Bookshop, under Dr. John Evans’s, capable management, now sells rare and out-of print books and publications on Papua New Guinea and the Pacific Islands. Dr. Evans, who knows more about books than anyone I know, made sure the UNI Bookshop regains its reputations as the best bookshop in the Papua New Guinea and the Pacific. A complete section holds any books and publications about Papua New Guinea and the Pacific. The UNI Bookshop is now the next place to recommend to anyone interested in books about Papua New Guinea if accessing one from the libraries in the country is impossible. I am glad I bought the book that day. I read the book several days later during a quite time at home. I read the book backwards, beginning with the Rosalie Everest’s story “Barefoot and Free”. The story interested me because Mrs. Everest, as she was known to me, was one of my inspiring teachers in Aiyura National High School between 1982 and 1983. Mrs. Everest, the ‘local meri’—a term used by her students to differentiate her from other expatriate teachers, taught me Expressive Arts with good nature and grace. She guided me to write and illustrate my first children’s story book in 1983. For that part in my education and growth I acknowledged her in my second book of poems: Hembemba: Rivers of the Forest (2000) published by the Institute of Pacific Studies (IPS) in Fiji. After I had read the book I pondered on how little we, Papua New Guineans, know our expatriate teachers, coworkers, helpers, mentors, friends, mates, and acquaintances. I knew Mrs. Everest for two years as her student, but hardly know the full background and the challenges she and family went through to live with us, work with us, and help us to find our place in the world. At least, Mrs. Everest, her husband Mr. Roy Everest (my biology teacher), like many well-meaning expatriates, gave their lives and time to develop our intellectual capacity without displaying frustrations, displeasure, unnecessary demands, or anger to belittle us. I also pondered on the importance of writing books in our lives. I was lucky to have someone like Mrs. Everest encouraged and mentored me in thinking about writing books before I entered the University of Papua New Guinea. Even though the unearthing of the literary and artistic talents came early to me I refused to think that I had any talents at all. I entered the University of Papua New Guinea to study Political Science and Public Administration. It was only in the third year of my studies did I make the final decision to study Literature as a field to make a career out of. Writing in the same book as Rosalie Everest are other expatriate women writers whose work and scholarship I have read. Among them are Mary Mennis, Lolo Houbein, and Amirah Inglis. Mary Mennis’s Hagen Saga is an indispensible text about the Catholic missionary experience in the Highlands of Papua New Guinea. The essay by Lolo Houbein on the theme of love in Papua New Guinean literature has been a source for several of my research papers on PNG literature. Amirah Inglis published two iconic books on colonial law and its application and misapplication: ‘Not a White Woman Safe’: Sexual Anxiety and Politics in Port Moresby 1920-1934 and Karo: The Life and Fate of a Papuan. I have never met these expatriate women writers and scholars, but their books and scholarships remain influential in the kind of research I do in literature and cultural studies in Papua New Guinea. Books and teachers are important part of our lives. The difference they make in our lives remains permanent marks we can never erase. I gained from reading this book the importance of writing down our experiences and publishing them in books for others to know who we are and the kinds of work and challenges we face in our lives every day. I appreciate reading the essays in the book, especially the stories of Andree Millar, Mollie Parer, and especially Tan Mow Yan Hing, whose shops in Wewak had so much childhood memories locked into it.